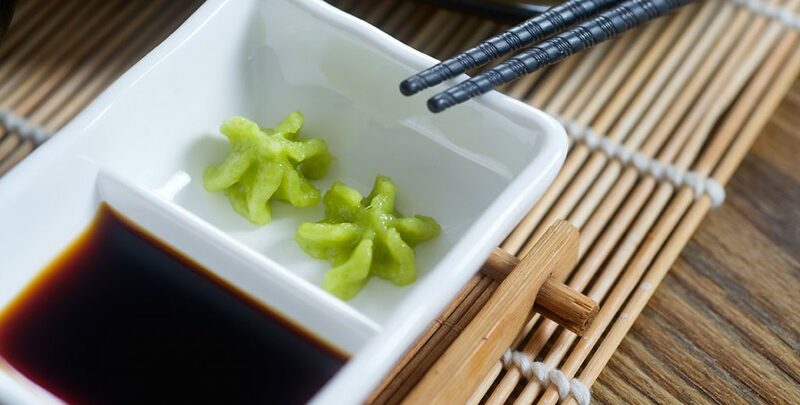 Wasabi is a staple ingredient in sashimi and sushi dishes. It is a seasoning of choice in many Japanese sauces and dressings, much like soy sauce and pickled ginger. Chances are that the first time you came across wasabi, you were very generous with it and learned your lesson too late–with a few tears shed in the process. The spice can be a lot for people to handle, but it’s great once you’re used to it. Here we’ll teach you exactly what wasabi is and how to utilize it in your sushi endeavors. The wasabi plant belongs to the Brassicaceae family. Other familiar ingredients in this plant family include horseradish and mustard. In fact, wasabi also goes by the name “Japanese horseradish.” The part most used in Japanese cuisine is the rhizome (the stem), finely grated into a paste or dried into a powder. Although this is the part of the plant that is traditionally used in Japanese cooking, the leaves are also edible. Only a few regions in Japan have the optimum conditions to commercially cultivate wasabi. The plant is very demanding. It can’t take direct sunlight, it needs temperatures ranging from 46°F to 70°F, and it loves the humidity of summertime. It also prefers water running down to it, preferably on a rocky bed. Because of these constraints, wasabi is costly to grow and is therefore expensive for consumption. North America is home to a few wasabi farms, but many who have tried to grow this temperamental plant have not been successful. Sadly, because of its prohibitive price, fresh wasabi is nearly impossible to come by and is fairly expensive in its paste or powder form. Even “real wasabi” products incorporate western horseradish and/or mustard. As far as mainstream produce is concerned, the tube of wasabi found in supermarkets may not even contain wasabi at all–even when the product has enough intensity to clear your sinuses when you brush some on your sushi rolls. If you’re lucky enough to have access to fresh wasabi, the experience is akin to participating in a ritual. You gently grate the stem on a shark skin-coated or porcelain grater and use as is. The flavor still packs a good punch, but it’s not quite as intense as it is in paste or powder form. Knowing it loses flavors within 15 minutes or so, high-end sushi restaurants will grate to order. When a culinary product in powder or semi-solid state is mixed with liquid it clumps, it results in an uneven distribution of heat. This is what happens when you mix soy sauce with wasabi paste or powder with soy sauce. As you dip that rainbow roll or beautiful piece of yellowtail at your favorite all-you-can-eat sushi restaurant, you want to coat the piece evenly so that you will be able to taste the wasabi and soy sauce all the way through. The best way to go about this process is to pluck a pea-sized dollop of paste from the serving plate and drop it in the mixing dish you’re provided with. Add a few drops of soy sauce (not too much) and stir to dissolve the wasabi. When you are satisfied no clump is left, add more soy sauce to taste. Back in the old days of consuming raw fish while not having refrigerators, wasabi was more a preservative than a condiment. Our modern world has thankfully kept the habit of adding the green-gold plant to our sushi plate, but we now have the peace of mind of eating fresher fish than was imaginable 1,000 years ago. For your next wasabi adventure, try RB Sushi for the best sushi in San Diego.